The Australian Open at the old Kooyong Stadium. 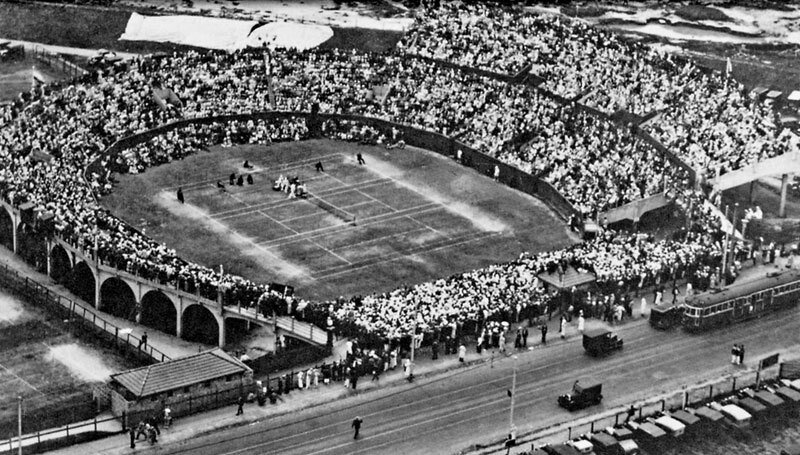 The Australian Open began as the Australian Tennis Championships at the Warehousemen’s Cricket Ground in Melbourne on Tuesday 21 November 1905. In order to join the Davis Cup competition (which had begun in the US in 1900) a national association had to be formed, but it was not until 1904 that the Australian Lawn Tennis Association, which also included New Zealand, was formally constituted. The Association was required to organize the Davis Cup challenge, to control interstate matches and to run an annual Australian Championships. It was agreed that the first championship would take place in Melbourne in 1905 and thereafter on a rotating basis in various capital city locations and in New Zealand. In 1972 the LTAA (now Tennis Australia) decided that the Australian Open required a permanent site and the Kooyong Lawn Tennis Club in Melbourne won the honour because it had the largest capacity and had attracted the greatest patronage. By 1980 the facilities at Kooyong were considered inadequate with little room to expand. 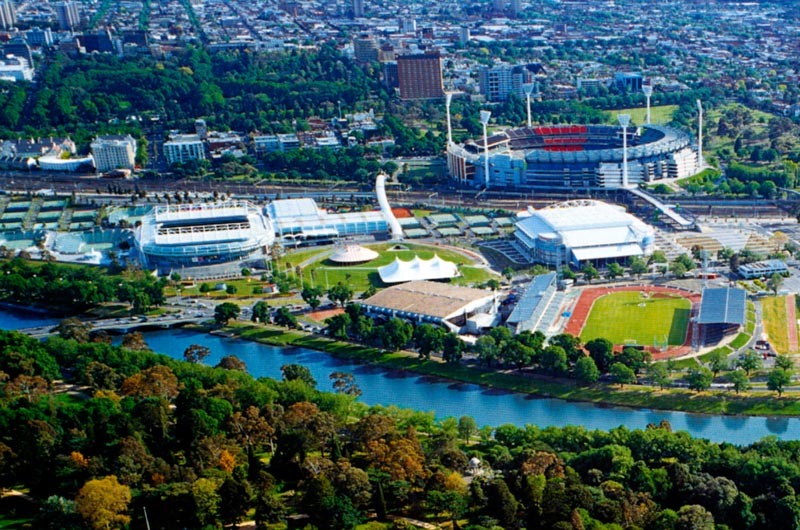 Because of the necessity to maintain the Australian Open as a Grand Slam tournament on the world stage, the Victorian government decided to construct a purpose-built venue at Flinders Park (now Melbourne Park), situated on the Yarra River, close to the city centre. Designed to be adapted for various events the main stadium included a retractable roof allowing the game to continue despite rain or excessive heat. Another consequence of the retractable roof was that a grass surface could not be used and so a rubberized synthetic surface designed in Australia and known as Rebound Ace was chosen. The new venue opened in 1988 and was an immediate hit with the players and public alike. Today these world-class facilities include five show courts (two with retractable roofs) and 19 other outdoor match and practice courts, as well as four indoor practice courts. The Australian Open is now the biggest sporting event on the Australian calendar, attracting over 500,000 visitors each year. Above, from several years ago, Melbourne Park aerial, including Olympic Park in foreground and MCG in background. 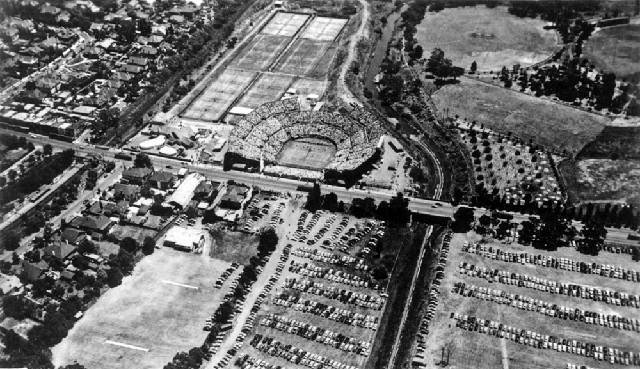 Below, aerial of a full house at Kooyong from well before the South-Eastern Freeway (now Monash Freeway) was built. 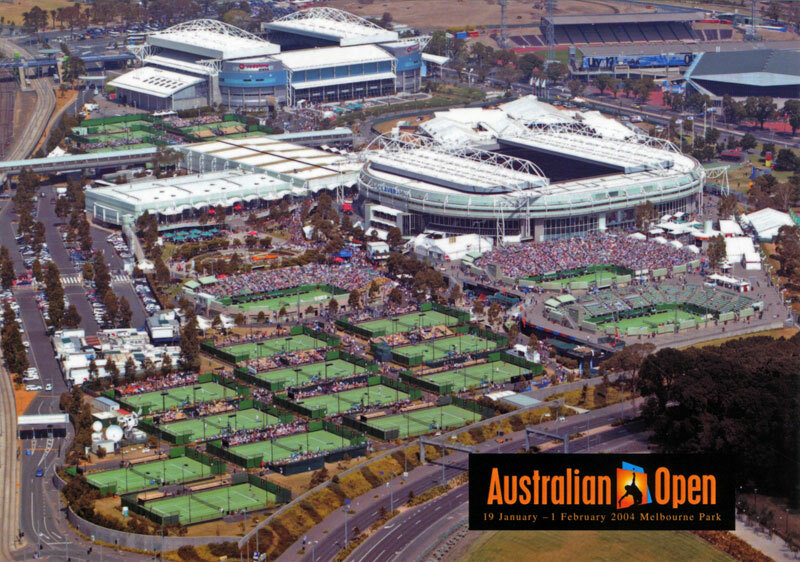 Postcard from 2004 of Melbourne Park, home of The Australian Open. A couple of recent photos. Work will start within weeks on Stage 3 of the Melbourne Park redevelopment, with the Andrews Labor Government investing $271 million to build a new show court in the central plaza area.